HomeNew filing in Peter Beagle’s lawsuit shows Connor Cochran’s history of abusive legal tactics. These tactics make court orders against him extra significant. Those are the cases that prevail through an attrition process. (He also uses an attrition process against cheated customers, as we described in 2014.) While the court orders may be costly, the tactic may inflict higher costs on opponents than they can recover. You may have seen many of Connor’s legal cases covered on our site, but the list keeps growing. This is the first mention of his ex-wife’s complaint – and now the following two cases of frivolous litigation he did against his own family. He sued two of his brothers for the inheritance money. Connor’s claims were suspiciously familiar. He said his mother was alcoholic and under undue influence to change her will in 1999, but there was no evidence and only he saw it. The “alcoholism” somehow stayed hidden for 14 years until he discovered it after he learned about the money. “For Connor From Charlie” indicates who else is behind a family dispute. Connor lost both lawsuits against his brothers in 2014. (” Petition to invalidate trust amendment is denied ” – and case PR30086 in Weld County, CO.) It didn’t matter that the first one failed. He went ahead with the same claim, and lost twice. Validity didn’t matter to him. The point was to inflict costs and try to win by attrition. You are reading correctly – Connor used a disgraced ex-lawyer and false claims about his own mother to bully his own family for money. 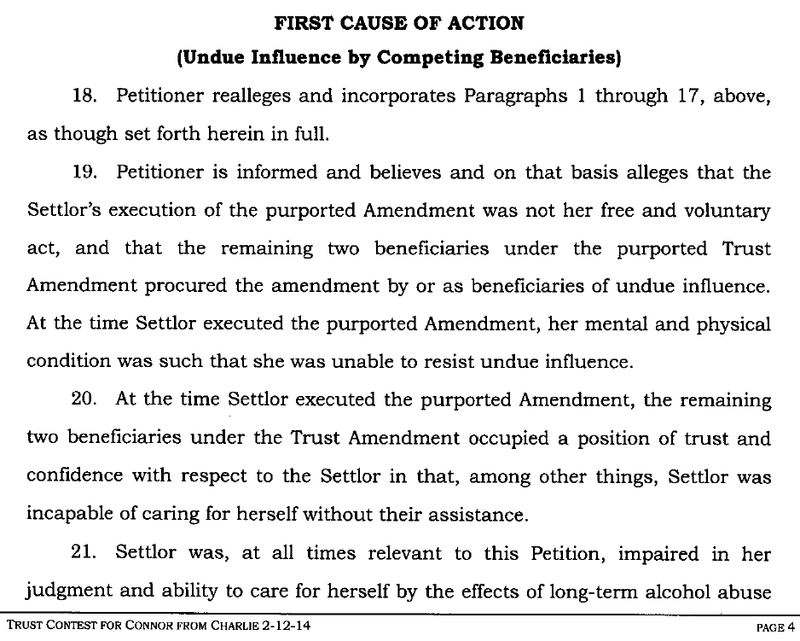 A year later, he used the same tactical claim of “alcoholism” and “undue influence” against Peter Beagle, despite medical evidence proving it was false. This time his target is alive, making it abuse by gaslighting. It is clear that nothing less than comprehensive sanctions will curb this obstructionist and contemptuous behavior. Defendants have exhibited this cavalier disregard for the authority of the Court over and over again. Defendant’s failure to produce documents responsive to the Court’s Order, even on the issues raised by their own Cross-Claim, is a blatant attempt to obstruct Plaintiff’s ability to prosecute his meritorious claims or defend against the frivolous allegations raised by the Cross-Claim. Their history and pattern of discovery abuse, as discussed hereinabove, indicates that issue, evidence, and/or terminating sanctions are both justified and appropriate. Intentionally stretching out the process while hitting back with frivolous claims is abuse itself. Connor Cochran uses such scorched-earth tactics to bully the elderly, who are the most harmed by delayed justice. Please support Peter and all who speak out about this predator. For anyone else still caught in the years of scams, it just gets more sad and ironic . Let’s end with something good from The Real Peter Beagle on facebook. With a story collection on the way and two new novels, you can tell this fight is worth it. 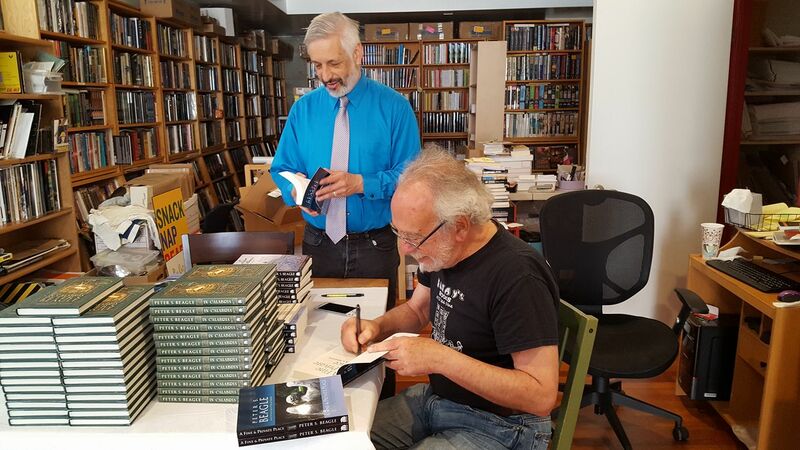 ← Peter Beagle seeks an injunction to stop unlawful sale of his work – his fans don’t know the money funds the opponent he is suing.